3. You should already have a good metal scraper tool. Mine came with my stove. If you don’t have one, they’re available multiples places online for purchase. I use the scraper to clean the burn pot, and to remove any creosote buildup that was too hard to remove with the brush. 4. Dust protection is also important. 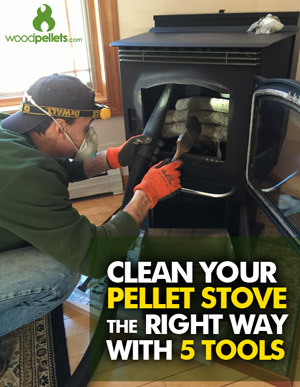 Wear gloves and a dust mask while you clean your pellet stove. Back when I first started using my stove, I cleaned the stove without dust protection. What I found was that the ash can be very harsh on your skin, and extremely difficult to clean off. By wearing gloves, you get to skip the tough hand washing step. Because cleaning out your pellet stove can produce a huge cloud of dust, I wear a mask to protect my lungs. Why would you want to take a chance breathing in all that dirty air? Speaking of dust – I learned a great trick that helps keep it from escaping into your house while you’re cleaning. On my Harman pellet stove, I have a setting that allows me to turn on the exhaust blower while cleaning the stove. This pulls all that dust out through the exhaust pipe, and prevents it from getting ash dust all over your house. I’m not sure if all stove models have this feature, but if yours does, it should always be the first step in your cleaning process. 5. Another great trick for minimizing dust in the house is using a shop vac with the special high-efficiency dust bags. Regular shop vac bags and filters can’t filter the tiny ash particles nearly as well as these high-efficiency bags that are made to capture fine powders. I made the mistake of using a regular bag the first couple cleanings, only to find that I had blown dust throughout my entire house. Needless to say, my wife wasn’t very happy with me. These high-efficiency bags work much better at containing the dust. 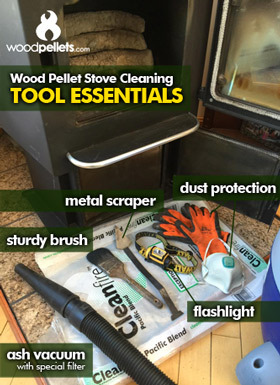 Last but not least – when it comes to cleaning your stove – your best friend is still your pellet fuel. High quality wood pellets have so much less ash that it can save you many, many hours of cleaning each season. The way I rationalize it, heating with pellets can be a great deal of work. By spending a bit more money on higher quality fuel, I reduce the amount of time spent cleaning. This means more time with my family, which is a trade-off that’s a no-brainer for me. Give us a call at 1-800-PELLETS if you have any questions. We’re happy to help!